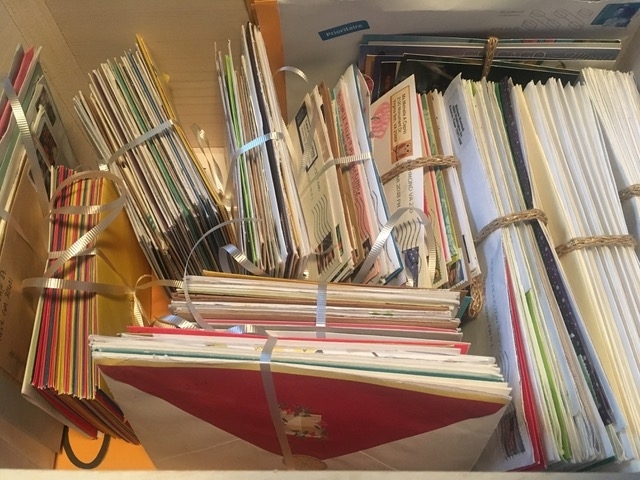 300+ love letters for Cody! — THE WORLD NEEDS MORE LOVE LETTERS. So I finally gave Cody his bundle on Friday night, the night before his birthday and I can safely say it was a success. I wrote him a letter including the request and a small explanation from me at the bottom (along with the music suggestions that people gave, but I didn’t let him look at that until after he opened the box). He proceeded to open one of them as our dad texted me telling him he was at our house waiting (he was taking us to Dave and Buster's for Cody's birthday). Cody disregarded this, too overwhelmed with everything around him. He promised me that he was going to read all of them as soon as he could. It was honestly such a wonderful experience and now that the whole college mailroom knows who I am, it’ll be fun to go back for any other shipments. He and I are incredibly grateful to have experienced this. It was such a good experience and a totally wild ride. Thank you, thank you, thank you to the bottom of my heart to the star beyond the moon. It put a smile on his face and that’s all I could have ever wanted. This experience even inspired me to start a Campus Cursive Chapter on my own campus!